The only other woman to have four tracks in the chart’s top 10 at the same time as Beyoncé, whose “Formation,” “Sorry,” “Hold Up” and “6 Inch” (featuring The Weeknd) occupied the Nos. 6, 7, 8 and 10 spots, respectively, on May 14, 2016 is Cardi B. The tunes debuted the same week that the diva’s Lemonade album entered at No. 1 on the Billboard 200. The Bronx native’s quartet is courtesy of her featured turn on G-Eazy’s “No Limit,” also featuring A$AP Rocky, at No. 2; “Motorsport,” with Migos and Nicki Minaj, at No. 3; her debut hit “Bodak Yellow (Money Moves)” holding at No. 5; and “Bartier Cardi,” featuring 21 Savage, which slides 7-9. 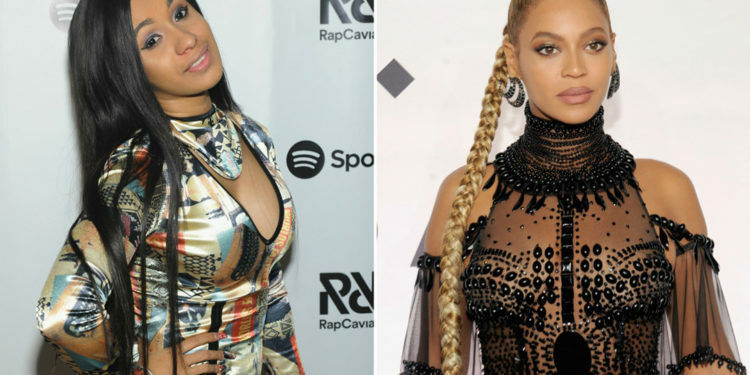 Now Cardi B and Beyonce are the only female musicians to have had this spot on top 10 chart.